As our colleagues at Earther put it, we have a decade to act, if we want to prevent the most extreme impacts of climate change. Dr. Sarah Myhre, a climate scientist who is currently a research associate at the University of Washington and the founder of the Rowan Institute, has argued forcefully that we need radical change—change that begins with new leadership (read: no more white men)—to tackle the scope and magnitude of the challenges we face in confronting the man-made climate crisis. We spoke about why she believes putting progressive women of color in charge is key to solving the climate crisis, why climate change disproportionately impacts women and girls around the world, and why collective action is our best hope. Our conversation has been condensed and lightly edited for clarity. 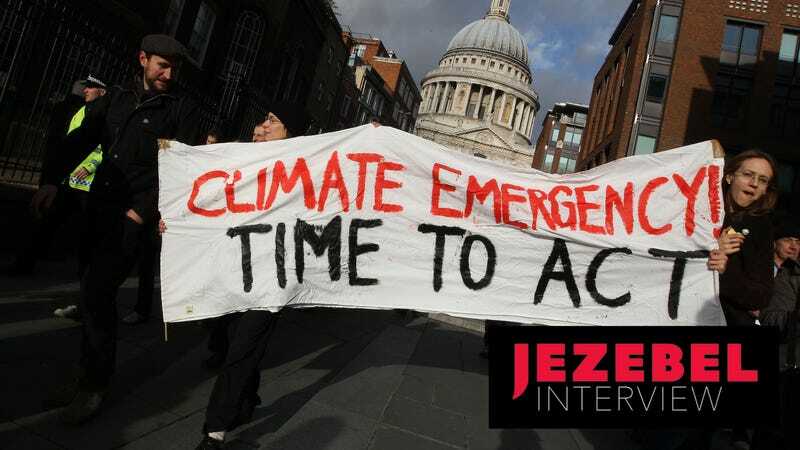 JEZEBEL: The United Nations’ report on climate change is terrifying. As the Times said, it paints a far more dire picture of the immediate consequences of man-made climate change—all in our lifetime. Dr. Sarah Myhre: The scale of change that’s coming is going to happen within my lifetime. So it should inform all of the kinds of radical cultural, economic, and political shifts in power and in decision-making that are in front of us. That is exciting because, as the report laid out, there is a way to retain and to maintain our commitment to a 1.5-degree Celsius global average of warming. The report also really describes the difference between a 1.5-degree world and a 2-degree world. It shows us we have very critical decisions to make right now about how we decarbonize the global economy. From my position as a scientist and as a citizen, I am particularly concerned about the lack of accountability of the particular bad actors that continue to profiteer off of warming the planet. There is a very clearly political aspect to this that we as scientists seem to refuse to talk about. And we do not do the work of indicting the bad actors that are profiteering and allowing the profiteering to move forward. So I think that’s one of the most critical pieces that lies in front of us. And that’s about having the moral courage to speak truth to power and to stand up in public. We as scientists are not trained to exercise moral courage and we’re not trained to stand up to power. You’ve said before, “Imagine a world where women are in charge. And then you’ll imagine a world without fossil fuels.” What do you mean by that? I think based on the events of the last week and a half, I would like to amend that specifically to women of color in charge. And this is aligned with why anti-racism is a fundamental component of climate action. Because when leaders can sit in a place that acknowledges the value and humanity of people who have been systematically erased, they are then prepared to get out in front of the kinds of consequences and trauma and loss of life that are coming to the people that are already systematically erased and devalued. It’s about the lens of moral attention that women of color bring to public scholarship and their public work. I am following in the footsteps of women of color. [They] are the fundamental leaders in this space right now—women of color and indigenous women, the water protectors. The existing paradigm of climate leadership has been focused on white men’s leadership. And their leadership is reductionist, technocratic, top-down, and it does not have a comprehensive moral attention to the people who are in the most danger. And so that leadership, I think, is a fundamental risk to the lives and the livelihoods of the people that have the most to lose in the future. Studies have shown that women around the world bear the brunt of the impacts of climate change, especially poorer women. Can you talk about why that is? I would point you to the scholarship of a woman scientist named Farhana Sultana. She’s a scientist who studies water, water insecurity, and gender. She talks about how the collection of water in the global South is a gendered activity. And women and girls gather water and carry water sometimes many miles a day, sometimes up to 40, 50 pounds of water for their families. In the report, [it states that] limiting global warming to a 1.5-degree ceiling would reduce the proportion of the world population that’s going to be experiencing water stress by up to 50 percent, [compared to] a 2-degree Celsius future. So water stress and the consequences to those at the lowest economic rung—this is the difference between life and death, education versus no education, access to clean water versus no clean water. This is a fundamental life and death variable that women particularly are accountable to in a patriarchal society where there’s gendered norms around the collection of water. You can imagine situations where, as water becomes more scarce, communities of women that are responsible for gathering water, they cannot invest time into other economic activities. They don’t have the capacity to send their girls to school. There are all these downstream consequences to the reproductive rights and autonomy of girls and the education of girls and women. The other statistic from the report that’s really important is essentially around susceptibility to poverty. Limiting global warming to 1.5 [degrees] would reduce the number of people exposed to climate related poverty by up to several hundred million, compared to a 2-degree Celsius future. Poverty is not just a monolith. It has deep gender and racial components that ultimately reflect scenarios where women of color and girls of color and their families have the most to lose. And that’s not just lose economic standing—this is life and death for communities. This is about people surviving or not surviving. Poverty is not just a monolith. It has deep gender and racial components that ultimately reflect scenarios where women of color and girls of color and their families have the most to lose. It sounds like you’re making the argument that to truly tackle climate change actually requires tackling issues like poverty and patriarchy. Absolutely. If the currency that we’re concerned about is human suffering, then fundamentally we are concerned with the consequences to the poorest and most vulnerable people. And this is why economic inequality is another axis for climate action. For example, on the west coast when we had the fire season, you can be damned sure that there were lots of wealthy people that could just fly away from that smoke, and did so, and just went on vacation. Whereas the families that are already hardest hit by air pollutants, those families in poverty, which are predominantly communities of color, they don’t have the economic resources to fly away. There are all these disparities in health outcomes that we are seeing already because of the consequences of climate change. It’s pretty clear what will happen if we don’t seriously take action. What do we need to do? We need representative leadership. We need leadership that is not old, white, and male. We need leadership that is truly representative of the communities that they serve. That leadership has the capacity to extend moral weight and value to communities of color, indigenous communities, and to women. One of the next things that we need to do is, we need to indict public brokers of power for their complicity and complacency in the face of this information. That means we look directly at these companies who are the wealthiest companies in the history of this planet. All of the components of leadership of these public companies should be indicted and shamed. They shouldn’t be able to hide between their fancy yachts and their billions of dollars. We need leadership that is truly representative of the communities that they serve. That leadership has the capacity to extend moral weight and value to communities of color, indigenous communities, and to women. We need policy and legislation that can put a price on carbon. We need collective mechanisms to change behavior. And the last on my list is individual action, because I think that’s often front-loaded in the narrative of climate solutions, and I don’t think that’s appropriate or true. Not eating meat, not eating dairy, taking public transportation, divesting from fossil fuels products, reducing plastic usage. Changing your vehicle to an electric vehicle, reducing or limiting your activity flying. All of those are on the table for individual choices and actions, but what we don’t often talk about is how classist those frames are. Because only the wealthiest of us can buy an electric vehicle and comprehensively reduce our greenhouse gas footprint. Because those of us who are struggling to pay rent, we cannot invest in a new vehicle. We don’t often talk about the classist frame of climate action and reveal it to be a sort of whitewashing. It disenfranchises huge groups of people and it’s a mechanism for public shaming. As a layperson, thinking about climate change can feel overwhelming. As a climate scientist, you think about all of this every day. How do you maintain optimism? I see my position not to peddle hope, but to encourage and to promote courage. And to demonstrate there’s a way to move through these very difficult times with a wholehearted embrace of our collective humanity and the value of doing things that are very difficult right now. These are values we all share. We share the need for clean water and clean air. We share the desire for our children to be free of the burden of asthma and air pollutants. Those core values are so fundamental, and we can tap into those core shared values and find the grace and the strength inside of that to say, yeah this is really hard, and that’s exactly why we’re showing up. This is exactly why we need to act collectively right now.